Doug Pinnick (of King's X fame) has joined forces with Bruce Franklin (of cult-legendary Trouble notoriety) for this one-off side project. Supershine is a rock band in spirit and style with the overall effect of an uplifting rock'n'roll sermon. Supershine gives the listener the great lead vocals and unmistakable bass playing of Doug Pinnick with the hard rockin' guitar of Bruce Franklin. Overall Supershine is simpler and harder than typical King's X yet not as classic heavy/funky as Trouble. Supershine's musical stew includes many ingredients, but simplicity and roots rule the day. A cover of Grand Funk Railroad's "Shinin' On" provides the link to the past that Supershine so eloquently captures. While no particular song stands out from the others there aren't any duds here either. "Trouble" is a worthy effort that will be enjoyed by fans of King's X, Trouble, Atomic Opera, and Queens Of The Stone Age. 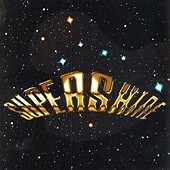 "Supershine" was produced by Bruce Franklin with Doug Pinnick; the disc was mixed and mastered by Ty Tabor (King's X). Supershine is Doug Pinnick on bass and lead vocals, and Bruce Franklin on guitar and vocals. Contributors include Jeff Olson (Trouble) on drums, Jerry Gaskill (King's X) on drums, Wall Farkas (Galactic Cowboys) on Hammond organ, and Heather Crow on backing vocals.